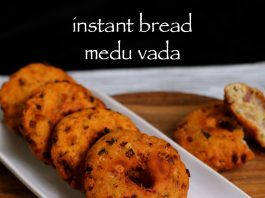 instant bread medu vada recipe or bread medu vada recipe with step by step photo and video recipe. 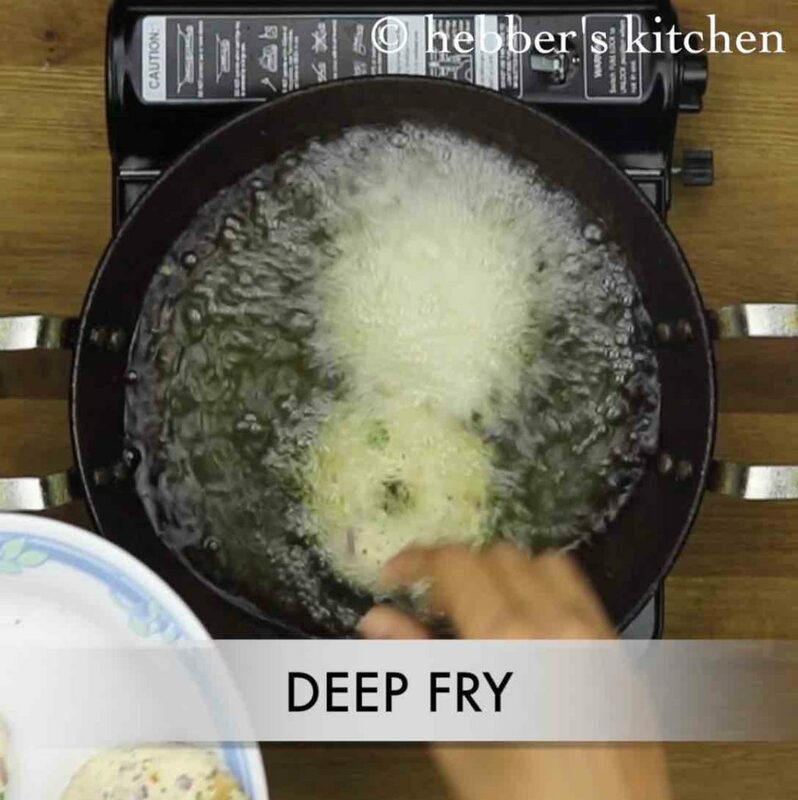 this instant recipe is shared by my aunt and she taught me how to make instant medu vada. 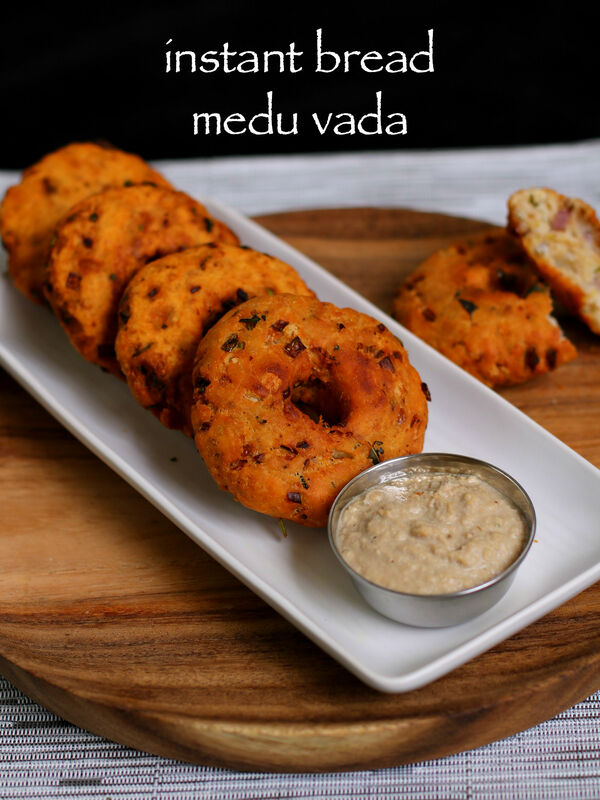 bread medu vada are crispy fritters made with left over bread and rice flour and enjoyed with sambar or chutney especially coconut chutney. 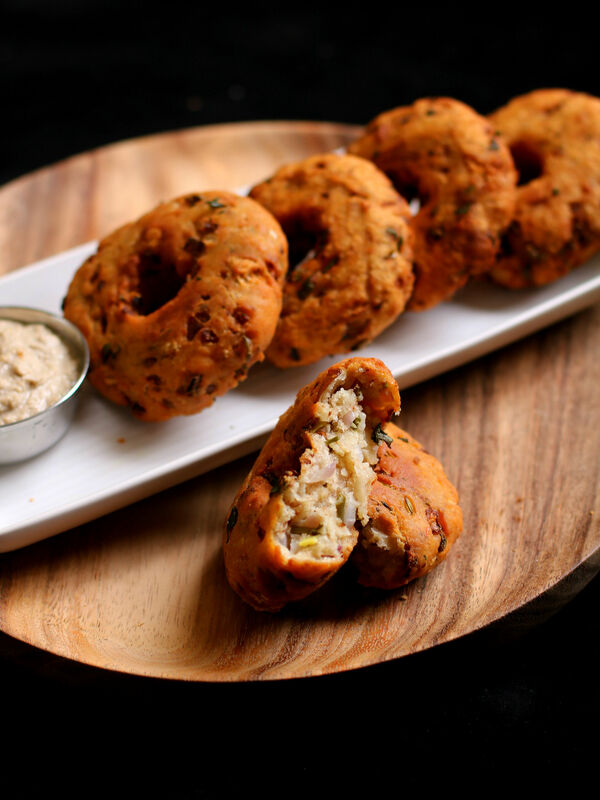 actually, i was craving for medu vada for my sunday breakfast, but at the same time i did not want go through the hassle of preparing the traditional urad dal medu vada. at the same time, there were few leftover breads and i was planning to finish it off. hence, i decided to prepare these instant medu vada, which is not only easy to prepare, but are also yummy and tasty. also, the rest of the ingredients are almost same. these crispy medu vadas taste delicious and this is indeed an easy and healthy snack recipe. these instant medu vadas do not absorb a lot of oil. moreover, these are light and nutritious, it makes for a great breakfast recipe too along with instant poha idli. 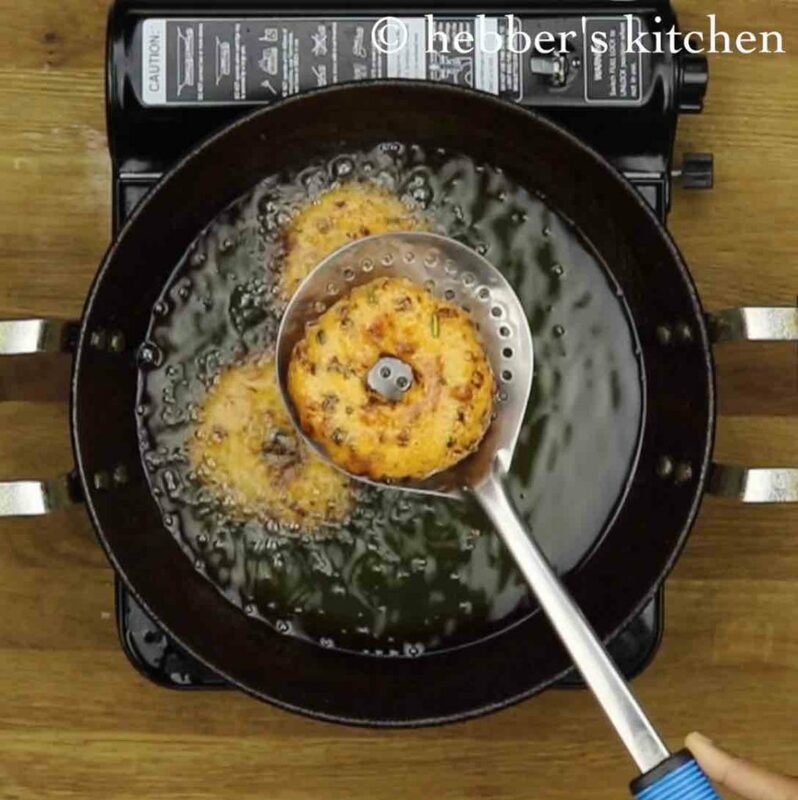 let’s get started with the recipe but just before that, check out my other snacks recipes, especially paneer tikka recipe, punjabi samosa recipe, dhokla, sabudana khichdi, vada pav, masala papad, gobi manchurian recipe, sweet potato pakoda fritters recipe, bread pakoda, medu vada, goli baje, sajjige vada, onion pakoda recipe. 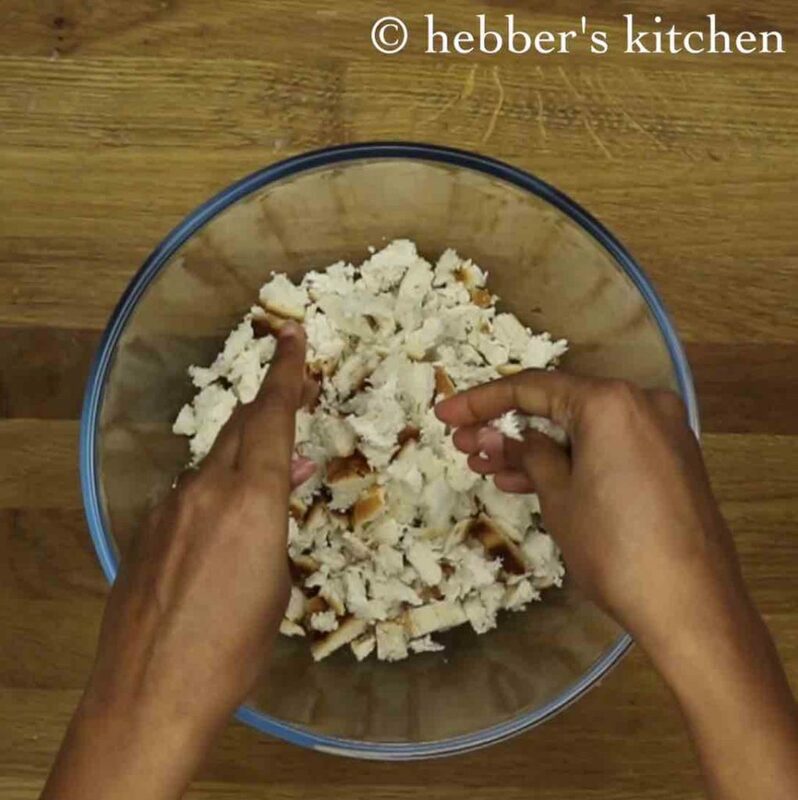 in a large mixing bowl take 6 slices of any bread and crumble them into small pieces. next, add rice flour, rava, curd. also add cumin seeds, onion, ginger, curry leaves, coriander leaves and salt. 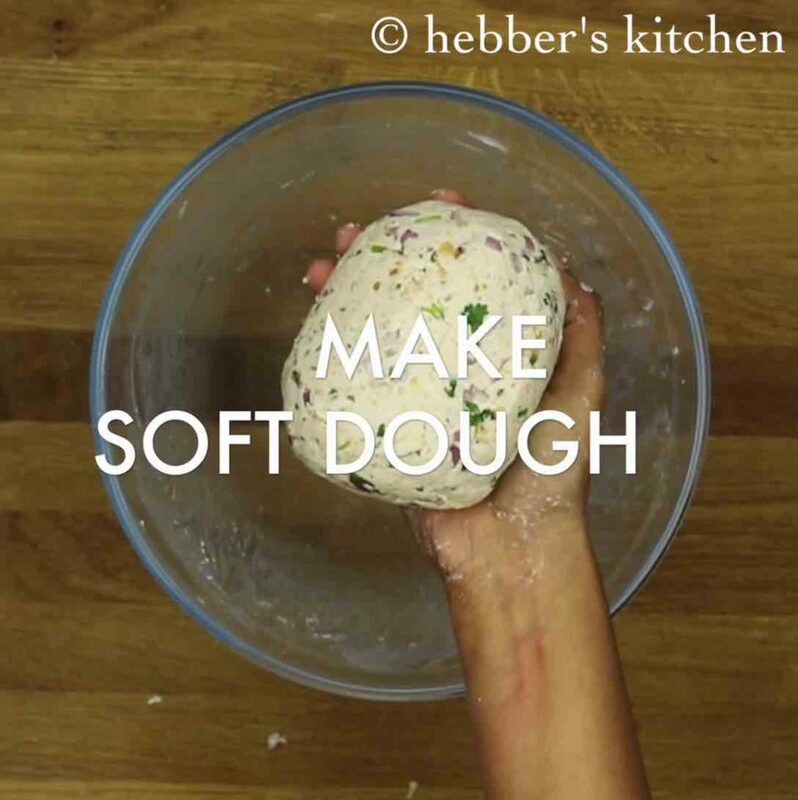 mix all the ingredients and form a soft dough. 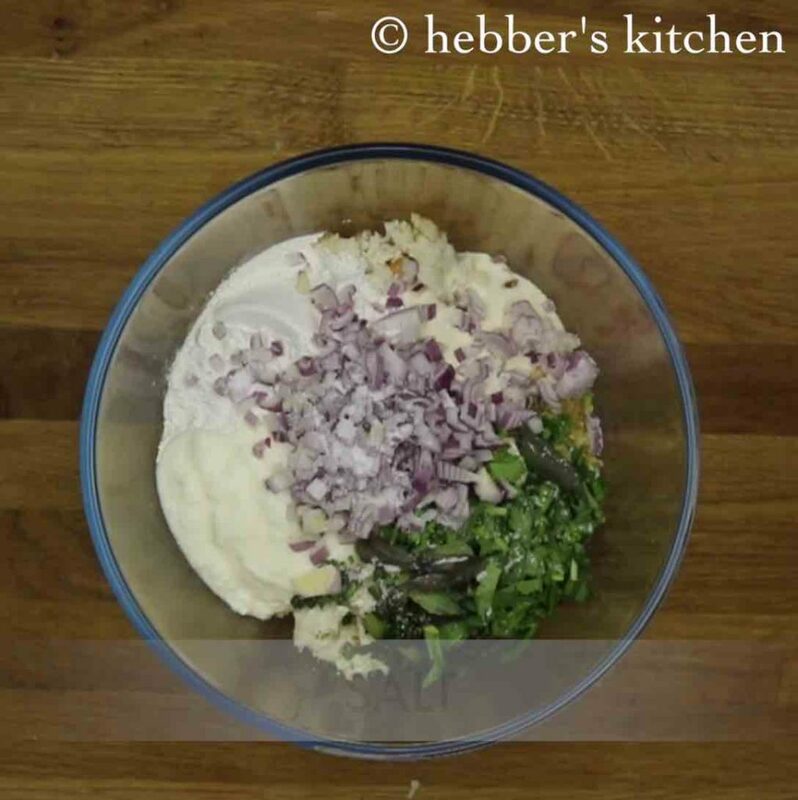 if you feel the dough is dry, you can add 1 to 2 tsp of curd to make it smooth dough. deep fry the vadas slowly on medium flame. fry on both sides till they turn golden brown. drain on paper towel to remove excess oil. serve hot vada with chutney or sambar. now make a small ball and gently press to flatten. then slowly create a hole in the centre like you prepare in medu vada. to make it more fluffy, add a pinch of baking soda. if you do not like spiciness then you can skip chillies. alternatively you can add veggies of your choice to make it more healthy. like coconut pieces, grated carrot, mint etc. you can also replace green chilli with pepper. Tried your Instant Bread Vada recipe – came out very well. It is definitely a handy snack – especially when you have some left-over bread. Thanks again for all your wonderful recipes. Can I bake this instead of deep frying? Superb, easy to cook recipe. I tried it for my guest and loved it but sorry I have not given cradet to you in front of them. Superb, easy to cook recipe. Thank you so much for sharing it with us. The vada were very doughy inside. I followed the recipe to the tee but still…. Feeling disappointed. What could have gone won’t? i think the oil was too hot, and hence the vada was not cooked inside. Your recipes are very good. I want to try this. Can you tell me what is measurement of 1 cup. Your recioes are so good and i saw people copying your bread dosa and rice dosa recipes an d putting them as their own! This recipe looks yum! Will definitely try. Do you have a recipe for ambode? Can we use brown bread? Can i skip the semolina? semolina helps to make ur vada crispy and tasty,.. so i do not recommend to skip..
Can I skip rice flour? Can I bake it in the oven after brushing some oil or can I shallow fry like a ragda / tikki. 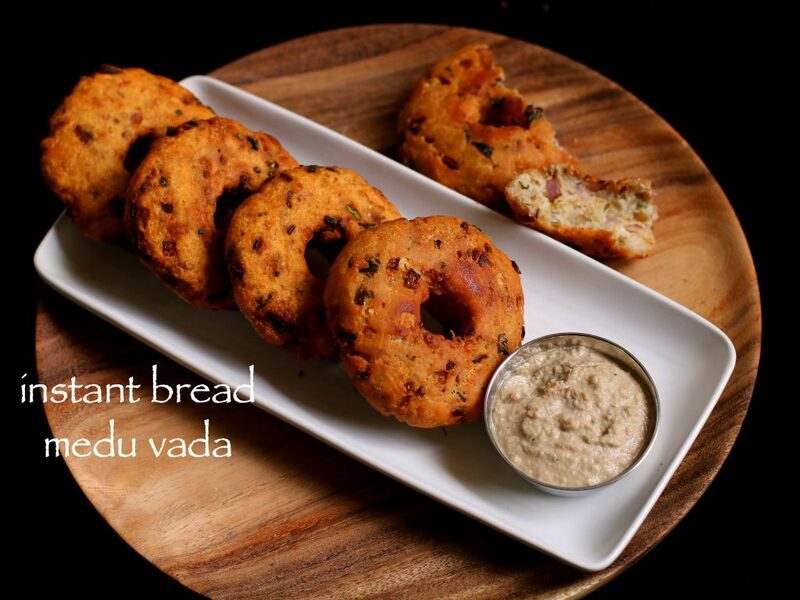 Thanks for the recipe, I will be making the instant bread medu vada for the family this weekend. Could you email me a recipe for the sambar (Sambol). will keep a watch out for further recipes.